The circular economy, recycling products after use, is cheap and environmentally friendly – but is it up to companies, consumers or the government to drive it forward? Some organisations are already doing this well. Carpet manufacturer Desso has a scheme whereby it takes back any waste carpet from customers irrespective of whether it is a Desso product or not; this is then sent to a recycling plant in Holland, the yarn is retrieved and is eventually made back into Desso carpet. “We are saving and making money for everybody, and creating new employment,” enthused Carole Monteregge, key accounts manager, Desso. Other stories in the room included National Grid’s closed-loop recycling of aluminium conductors, M&S’s Shopping scheme for used clothes and Cisco’s redeployment of London 2012 IT infrastructure to recipients including WWF. Individuals and organisations are also sharing each other’s unused capacity, such as the rapid growth of spare-room holiday lets via Airbnb.co.uk. Benita Matofska, founder of The People Who Share, has calculated the potential worth of unused goods, property and empty spaces globally to be worth a potential £3.5tn, “and that is just what we’ve been able to source and document – the actual figure is likely to be much more”. There was a debate, however, as to where best to concentrate such efforts: on the consumer or on the business world. 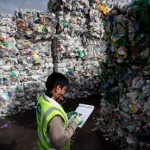 Chris Dow, chief executive of Closed Loop Recycling, believed that the consumer is “the magic bullet in all of this” – once persuaded by the worth of a circular economy, both economically and environmentally, consumer demand would be such to force the business world to change, said Dow. Landfill tax was upheld as an example of a positive regulation driving business toward the ethos of reduce, reuse and recycle. However, on the flip side are regulations driving the wrong behaviours. Dow mentioned a government subsidy that still exists to send recycling overseas, despite the carbon and economic costs of doing so. For National Grid, said Bailey, a major headache is caused by clay deposits removed during tunnelling being classified as waste (and the strict regulations that come with that) despite being a reusable material for the company. Mark Walker, general manager of car club company Zipcar UK, informed that a new sub-75g emissions limit for the London congestion charge means “we are no longer incentivised to buy fuel-efficient cars” due to a lack of suitable cars on the market. What is needed, concluded Walker, is “a pincer movement” of all the relevant parties – consumers, business and government – coming together. All three know that using fewer resources is better for them and for the planet. But it is only by collaboration that the goal of a circular economy can move from a concept to a reality. “M&S set itself a target of zero waste to landfill without really understanding how we were going to get there,” said Barry. “I think these big goals drive a level of innovation that none of us can imagine … sometimes that’s how business works, you set the target and then you find the innovation”.